For the document preparation system and markup language, see LaTeX. Latex is a stable dispersion (emulsion) of polymer microparticles in an aqueous medium. It is found in nature, but synthetic latexes can be made by polymerizing a monomer such as styrene that has been emulsified with surfactants. Latex as found in nature is a milky fluid found in 10% of all flowering plants (angiosperms). It is a complex emulsion consisting of proteins, alkaloids, starches, sugars, oils, tannins, resins, and gums that coagulate on exposure to air. It is usually exuded after tissue injury. In most plants, latex is white, but some have yellow, orange, or scarlet latex. Since the 17th century, latex has been used as a term for the fluid substance in plants. It serves mainly as defense against herbivorous insects. Latex is not to be confused with plant sap; it is a separate substance, separately produced, and with separate functions. The word latex is also used to refer to natural latex rubber, particularly non-vulcanized rubber. Such is the case in products like latex gloves, latex condoms and latex clothing. Originally, the name given to latex by indigenous Equator tribes who cultivated the plant was “caoutchouc”, from the words “caa” (tear) and “ochu” (tree), because of the way it is collected. Latex: Colloidal dispersion of polymer particles in a liquid. [a]Synthetic latex: Latex obtained as a product of an emulsion, mini-emulsion, micro-emulsion, or dispersion polymerization. The cells (laticifers) in which latex is found make up the laticiferous system, which can form in two very different ways. In many plants, the laticiferous system is formed from rows of cells laid down in the meristem of the stem or root. The cell walls between these cells are dissolved so that continuous tubes, called latex vessels, are formed. Since these vessels are made of many cells, they are known as articulated laticifers. This method of formation is found in the poppy family and in the rubber trees (Para rubber tree, members of the family Euphorbiaceae, members of the mulberry and fig family, such as the Panama rubber tree Castilla elastica), and members of the family Asteraceae. For instance, Parthenium argentatum the guayule plant, is in the tribe Heliantheae; other latex-bearing Asteraceae with articulated laticifers include members of the Cichorieae, a clade whose members produce latex, some of them in commercially interesting amounts. This includes Taraxacum kok-saghyz, a species cultivated for latex production. In the milkweed and spurge families, on the other hand, the laticiferous system is formed quite differently. Early in the development of the seedling, latex cells differentiate, and as the plant grows these latex cells grow into a branching system extending throughout the plant. In many euphorbs, the entire structure is made from a single cell – this type of system is known as a non-articulated laticifer, to distinguish it from the multi-cellular structures discussed above. In the mature plant, the entire laticiferous system is descended from a single cell or group of cells present in the embryo. The laticiferous system is present in all parts of the mature plant, including roots, stems, leaves, and sometimes the fruits. It is particularly noticeable in the cortical tissues. Latex is usually exuded as a white liquid, but is some cases it can be clear, yellow or red, as in Cannabaceae. Latex is produced by 20,000 species from over 40 families occurring in multiple lineages in both dicotyledonous and monocotyledonous types of plant. It is also found in conifers and pteridophytes. Among tropical plant species 14% create latex, as opposed to 6% of temperate plant species. Several members of the fungal kingdom also produce latex upon injury, such as Lactarius deliciosus and other milk-caps. This suggests it is the product of convergent evolution and has been selected for on many separate occasions. carries with it at the same time such disagreeable properties that it becomes a better protection to the plant from enemies than all the thorns, prickles, or hairs that could be provided. In this plant, so copious and so distasteful has the sap become that it serves a most important purpose in its economy. Evidence showing this defense function include the finding that slugs will eat leaves drained of their latex but not intact ones, that many insects sever the veins carrying latex before they feed, and that the latex of Asclepias humistrata (sandhill milkweed) kills by trapping 30% of newly hatched monarch butterfly caterpillars. Other evidence is that latex contains 50–1000× higher concentrations of defense substances than other plant tissues. These toxins include ones that are also toxic to the plant and consist of a diverse range of chemicals that are either poisonous or "antinutritive". Latex is actively moved to the area of injury; in the case of Cryptostegia grandiflora, this can be more than 70 cm. The clotting property of latex is functional in this defense since it limits wastage and its stickiness traps insects and their mouthparts. It has been noted that while there exist other explanations for the existence of latex including storage and movement of plant nutrients, waste, and maintenance of water balance that "[e]ssentially none of these functions remain credible and none have any empirical support". The latex of many species can be processed to produce many materials. 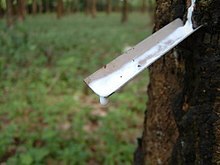 Natural rubber is the most important product obtained from latex; more than 12,000 plant species yield latex containing rubber, though in the vast majority of those species the rubber is not suitable for commercial use. This latex is used to make many other products including mattresses, gloves, swim caps, condoms, catheters and balloons. Balatá and gutta percha latex contain an inelastic polymer related to rubber. 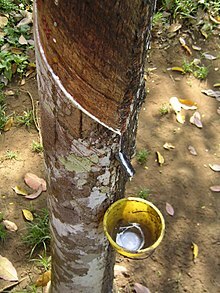 Latex from the chicle and jelutong trees is used in chewing gum. 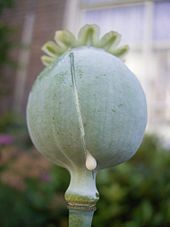 Dried latex from the opium poppy is called opium, the source of several useful alkaloids, such as morphine, codeine and papaverine, as well as the street drug heroin. Synthetic latexes are used in coatings (e.g. latex paint) and glues because they solidify by coalescence of the polymer particles as the water evaporates, and therefore can form films without releasing potentially toxic organic solvents in the environment. Other uses include cement additives, and to conceal information on scratchcards. Latex, usually styrene-based, is also used in immunoassays. Some people only experience a mild allergy when exposed to latex, like eczema, contact dermatitis or developing a rash. Others have a serious latex allergy, and exposure to latex products such as latex gloves can cause anaphylactic shock. Guayule latex has only 2% of the levels of protein found in Hevea latexes, and is being researched as a lower-allergen substitute. Additionally, chemical processes may be employed to reduce the amount of antigenic protein in Hevea latex, yielding alternative materials such as Vytex Natural Rubber Latex which provide significantly reduced exposure to latex allergens. About half of people with spina bifida are also allergic to natural latex rubber, as well as people who have had multiple surgeries, and people who have had prolonged exposure to natural latex. Several species of the microbe genera Actinomycetes, Streptomyces, Nocardia, Micromonospora, and Actinoplanes are capable of consuming rubber latex. However, the rate of biodegradation is slow, and the growth of bacteria utilizing rubber as a sole carbon source is also slow. ^ The polymer in the particles may be organic or inorganic. ^ a b c d e f g h Anurag A. Agrawal; d Kotaro Konno (2009). "Latex: a model for understanding mechanisms, ecology, and evolution of plant defense Against herbivory". Annual Review of Ecology, Evolution, and Systematics. 40: 311–331. doi:10.1146/annurev.ecolsys.110308.120307. ^ "Natural Materials - Coco-mat". Coco-mat. Archived from the original on 2017-06-18. Retrieved 2017-07-04. ^ a b c Stanislaw Slomkowski; José V. Alemán; Robert G. Gilbert; Michael Hess; Kazuyuki Horie; Richard G. Jones; Przemyslaw Kubisa; Ingrid Meisel; Werner Mormann; Stanisław Penczek; Robert F. T. Stepto (2011). "Terminology of polymers and polymerization processes in dispersed systems (IUPAC Recommendations 2011)" (PDF). Pure and Applied Chemistry. 83 (12): 2229–2311. doi:10.1351/PAC-REC-10-06-03. Archived (PDF) from the original on 2013-10-20. ^ "Taraxacum kok-saghyz". Pfaf.org. Archived from the original on 2014-03-20. Retrieved 2013-03-21. ^ Thomas M. Lewinsohn (1991). "The geographical distribution of plant latex". Chemoecology. 2 (1): 64–68. doi:10.1007/BF01240668. ^ Joseph F. James (1887). "The milkweeds". The American Naturalist. 21: 605–615. doi:10.1086/274519. JSTOR 2451222. ^ J. E. Bowers (1990). Natural Rubber-Producing Plants for the United States. Beltsville, MD: National Agricultural Library. pp. 1, 3. OCLC 28534889. ^ "Latex Allergy | Causes, Symptoms & Treatment". ACAAI Public Website. Retrieved 2019-03-24. ^ "Latex Allergy - Eco Terra". Retrieved 2018-10-10. ^ Anderson, Christopher D.; Daniels, Eric S. (8 May 2018). "Emulsion Polymerisation and Latex Applications". iSmithers Rapra Publishing. Retrieved 8 May 2018 – via Google Books. ^ "Latex allergy - Symptoms and causes". mayoclinic.com. Archived from the original on 7 October 2013. Retrieved 8 May 2018. ^ Helge B. Bode; Axel Zeeck; Kirsten Plückhahn; Dieter Jendrossek (September 2000). "Physiological and Chemical Investigations into Microbial Degradation of Synthetic Poly(cis-1,4-isoprene)". Applied and Environmental Microbiology. 66: 3680–3685. doi:10.1128/aem.66.9.3680-3685.2000. PMC 92206. PMID 10966376. ^ Rose, K.; Steinbuchel, A. (2 June 2005). "Biodegradation of Natural Rubber and Related Compounds: Recent Insights into a Hardly Understood Catabolic Capability of Microorganisms". Applied and Environmental Microbiology. 71 (6): 2803–2812. doi:10.1128/AEM.71.6.2803-2812.2005. PMC 1151847.